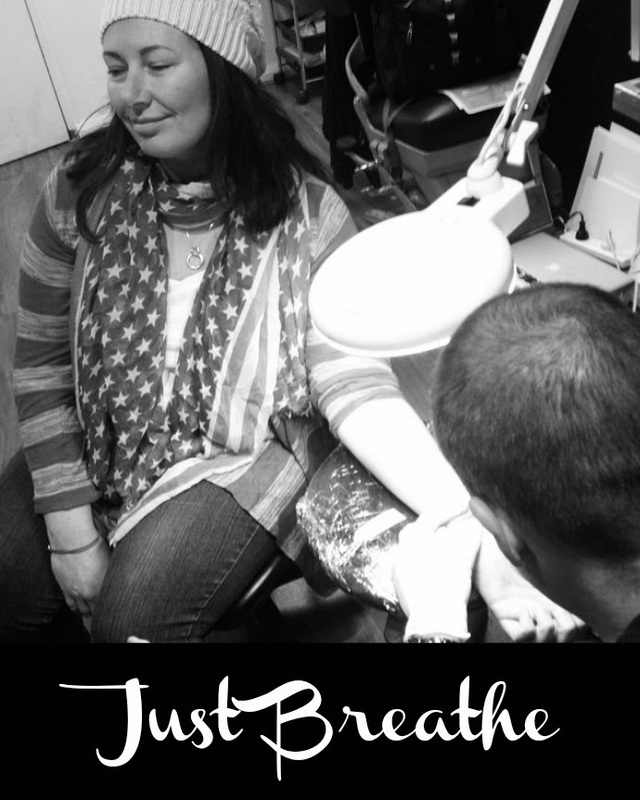 To many people, having the words 'Just Breathe' tattooed onto your wrist seems kind of DERish. I get that, I mean who needs to remember to do something so basic as breathing? But to anyone who has struggled to breathe in the middle of a panic attack or a moment of pure desperation - those two words carry so much meaning. It's such a simple thing to do isn't it? I mean you don't even really have to think about it! You just breathe. But how many times a day do things / events / people get to you and you end up holding your breath without even thinking about it. You literally forget to breathe? I am a major breath holder from way back. When I worry - I hold my breath. When I panic - I hold my breath. When I am nervous or stressed or overwhelmed - I hold my breath. A few years ago when anxiety and I were engaged in a constant battle, the panic would set in for me any where and at any time. I cannot tell you how many times I have been in a shopping centre or out somewhere with a friend, when for no reason that lump in the throat made it impossible to swallow, my chest would start pounding and my heart would race at what felt like hundreds of beats per second. Or then there were the nights when everyone was sleeping and the darkness would feel like it was literally suffocating me and I needed to escape somewhere, anywhere. All I could do when that happened was to tell myself over and over again "Just breathe Sonia, Just breathe". Even now (touch wood) that the anxiety has subsided, I still use this mantra daily. When the kids are going off and the bird and dogs are going nuts, there is work to be done, deadlines looming, dinner to be made and gahhhhh stuff that is just literally sucking the air out of me.... I find a quiet place to sit, close my eyes and just breathe. A year ago when I was in Bali having a fabulous time celebrating my mid life crisis and making ginormous life changing decisions, I decided I wanted to get my mantra tattooed onto my wrist. It would act as reminder always that no matter what happens or how out of control life ever feels, I simply need to stop and just breathe and then go from there. I do already have one tattoo on my lower back - the protective eye (which is very handy when it comes to convincing your children you have eyes in your back and can see like everything), so tattooing is not entirely new to me. That said I'm not an overly spontaneous gal, unless of course we are talking about online shopping cause then I'm totally all 'click' oops I accidentally just entered my credit card details for that cushion, candle, stationary, Global direct genie bra... whatever. But for big things like a tattoo - I need to sit on that thought for a while and then come to a comfortable decision. A year on, I reached that comfortable conclusion that yep I'm ready to do this. And so over the weekend we headed into Manly to a renowned tattoo artist Caspian DeLooze and he worked his magic on my wrist whilst my hubby and kids watched on. It's not for everyone. I respect that. It is a very personal choice... kind of like having your ears pierced or your hair dyed a different colour. Only you can answer why you feel the need to do it and you don't really owe anyone else an explanation. Granted, the irony comes into play when you think about how much I hate the scars on my legs. If I am so put off by the scars I already have, why on earth would I go and willingly scar myself with ink? The answer is that this is a scar I choose to wear. It is a scar that doesn't act as a reminder of painful memories, rather it is a symbolic scar that will forever more remind me of the strength I have within myself to deal with what ever life decides to throw at me. 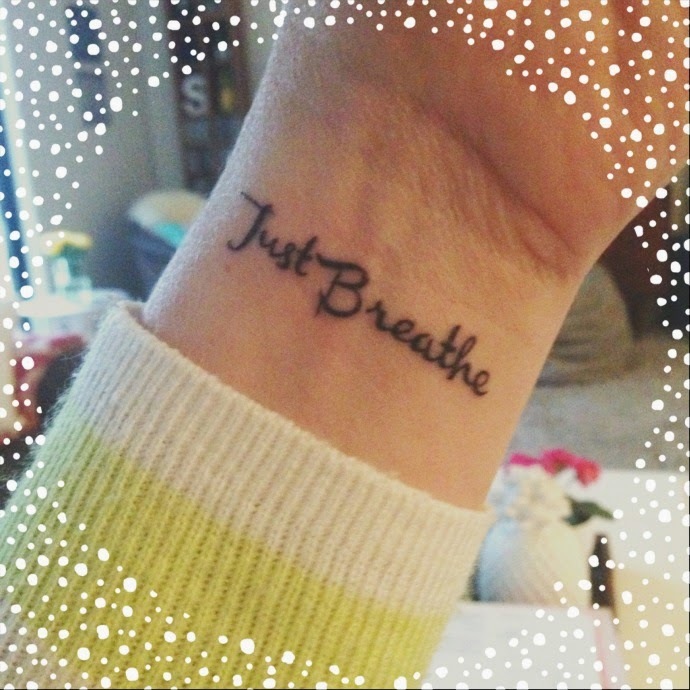 It's a visual and emotional reminder that all I need to do to get through anything is 'Just Breathe' and then take it from there. Do you have any tattoos? What do they mean to you? Geez Did I Write That! Morning Has Broken And So Has Mummy! Are You a Natural Talker or a Listener? Regrets. We All Have Them... Don't We?